"King Amroth turned, his tearful eyes glistening in the diffused moonlight. No one else dared brave the storm, yet he stood there, arms outstretched, at the stern. He looked like he could fly. Cirdur hung on to the ripping sail as the swan ship pitched again. Suddenly, as he desperately screamed to the king, the great bell in the Seaward Tower tolled. Even across the miles of roaring water, the notes drowned out his last pleas. Then a wave blasted him against the rail. The salt water filled his nose and bit at his cheeks, stunning him with punishing force. Cirdur did not know how long he lay there -- it didn't seem long -- but as he rose to his knees, he saw that Amroth had gone. He cried." 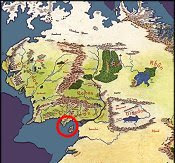 Thus the cliff-city of Lond Ernil became Dol Amroth. 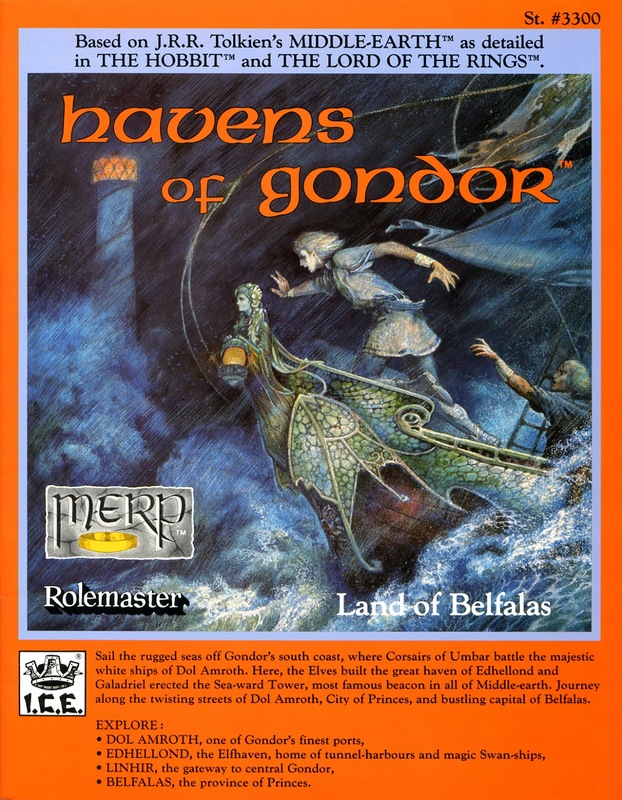 But my admiration for Havens of Gondor isn't shared by many -- or at least it wasn't back in the '80s. The sales clerk at my local comic store dismissed it as an empty product, and a college friend opined it was the most disappointing thing ICE had published to date. But I think this sentiment owed, at least in part, to the impatience for Gondor's famous cities (Pelargir was just around the corner, and the two Minases more distant), and I admit I sort of felt this way myself. But I quickly fell in love with the Belfalas region. It was a segment of Tolkien's world I knew so little about at the time, and was awed by ICE's delineation of its elvish heritage, relative independence, and strange aloofness from the dirtier politics of Gondor's other provinces. I read this module and wanted to walk the cliff-heights of Dol Amroth, sail the white ships, and visit the elves of Edhellond. I was intrigued by the half-elven blood of Dol Amroth's princes (from TA 2004 onwards), and by Galadriel's influences resonating from the Second Age. These weren't the Grey Havens, but they did feel surpassing in a way I couldn't put my finger on. The module is light on layouts and really has no "dungeons" to throw players against, though I was accustomed to designing my own dungeons (or using TSR's) for Middle-Earth sandboxes anyway. Havens of Gondor is a cultural gazeteer, above all, and a compelling one. And the mapwork isn't quite as dire as I heard it decried. Dol Amroth, at least, impressed me enough to make it the one place in Middle-Earth I'd choose to spend my retirement. The Seaward Tower on the city's western cliff is singled out for special treatment, and I like how Galadriel built it to commemorate the Last Alliance, infusing it with the power of Nenya "so that none but the Valar can bring it down". The elf-haven of Edhellond is fairly presented, split in two parts, one above on a hill exposed to tasty sea breezes, the other below in a hidden harbor where its magic swan ships are kept. To this day I still have fantasies of growing old by the Belfalas coastline, frequenting the Lost Elf tavern, mixing with men and elves, and staring out to sea where that immortal king drowned searching his lost love. Next up: Sea-Lords of Gondor.